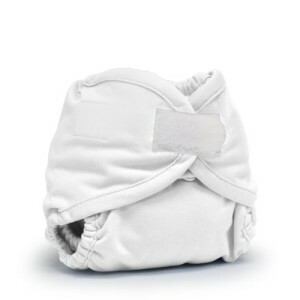 The Rumparooz Newborn Cloth Diaper Cover is designed to grow with your baby with 3 adjustable rise settings that are designed to fit your preemie and newborn. Weight range of cover starts at 4 pounds and will fit up to approximately 15 pounds. Rumparooz Newborn Cloth Diaper Covers are generously sized and designed to fit over most newborn fitted or prefold diapers. Covers may be used multiple times before washing but should be placed into the laundry if it becomes soiled. Kanga Care uses a water resistant polyester TPU which is a solvent-free polyester fabric that has been laminated with a thermoplastic polyurethane using a heat bonding process, not chemicals. This process is low in toxicity and is better for the natural environment then traditional PUL. WASH & CARE: 1. Cold Rinse, no detergent. 2. Hot Wash/Cold Rinse with the suggested amount of detergent (see www.kangacare.com for full list of recommended detergents). Lay flat to dry (diapers dry FAST!) All Kanga Care products are designed and invented by Julie Ekstrom, mom and CEO of Kanga Care, and distributed worldwide out of Golden, CO.Newborn / Preemie Cover = 3 Sizes in One! The Rumparooz Newborn / Preemie Diaper Covers have 3 adjustable rise settings that are designed to fit your tiny baby from 4 – 15 lbs.